The goddess Athena was a superb strategist and many of the Greek myths recount tales of her help given to various gods, goddesses, and heroes as they went into battle or faced seemingly impossible tests. 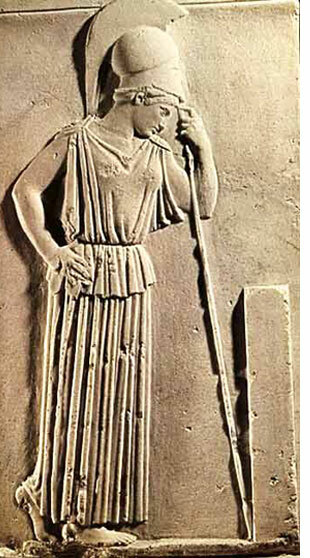 Although she was widely known in one of her roles as Athena the Goddess of War, it was as a mediator and a planner that she excelled. She always worked to prevent war, but once war had been joined the goddess Athena fought efficiently for her side. The Greek goddess Athena championed many heroes, offering them her advice and protection, helping them to win their battles. In one of her most famous adventures Athena would assume the shape of various men, women, and children to guide the wandering Odysseus. Her protection allowed the suffering hero to finally return safely to his home and family. Nike, the goddess who personified Winged Victory, often accompanied the goddess Athena. Not surprising, since Athena, Goddess of War never lost a battle. The quarrel of Athena and Poseidon, the god of the sea, is widely known. They were both competing on being the patron deities of the city of Athens so it was decided that the one who would offer the Athenians the best gift would win. Poseidon hit his trident hard on a side of the hill and a fountain made its appearance while the people were impressed by the gift. The only drawback was that the water of the fountain was salty like the water of the sea where Poseidon was the ruler so the fountain wasn't very useful. The present of Athena was an olive tree, a useful gift since it could produce olives, oil and wood at the same time. So, Athena won the competition infuriating Poseidon who flooded the plain of Attica. In the end, both gods cooperated for the good of the city.